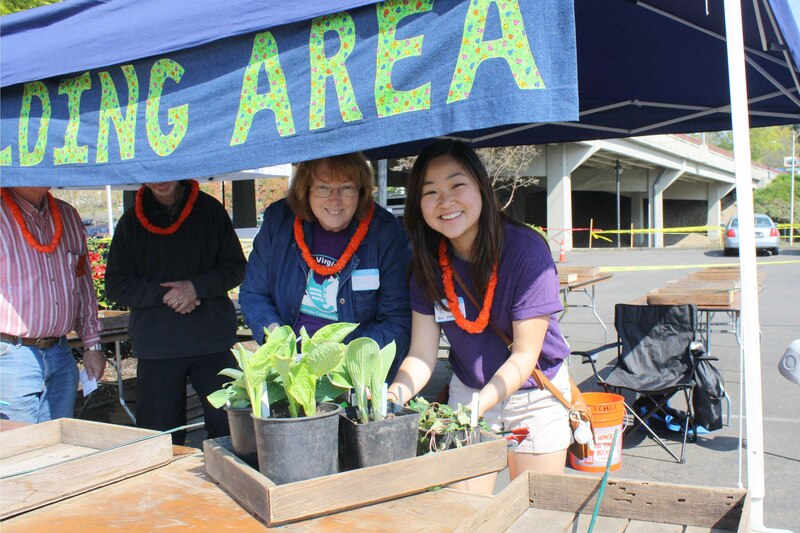 Holly Scholz from the Class of 1998 invited local alumni and Ford Scholars to join her at the OSU Extension Master Gardeners Plant Sale in Eugene on Saturday, April 18. Class of 1997 alumna Diana Barkelew readily agreed to help out, saying she loved gardening. Alumna and Ford Scholarship Office Administrative Associate Shauna Harper from the Class of 2007 joined them on a beautiful sunny morning. Current University of Oregon Ford Scholars Robin Hill and Kadyn Nguyen also volunteered. Hill, an art major, happily painted kids’ faces in the Kids’ Zone while Nguyen and the others worked tallying sales and running the holding area during the busiest time of the plant sale. When the sale slowed down in the early afternoon, the volunteers took their turn browsing the array of healthy starter plants for their own gardens.